My previous blog posts in the series have led us to this next step: Designing and building your cybersecurity program to achieve both your cyber risk management and compliance goals. Let’s review the design now. 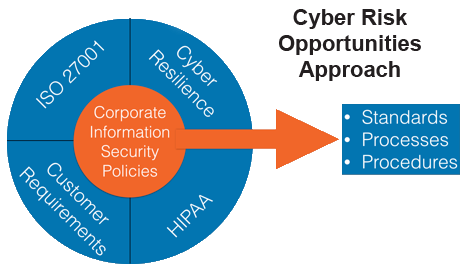 Allow your organization to practice reasonable cybersecurity largely though great cyber hygiene. Because of the increasing pressure at the executive level to be compliant with information security laws and regulations, the importance of being compliant sometimes overshadows the rest of your program goals. It’s not a good idea to optimize your cybersecurity toward compliance! So, you need to figure out how to cost-effectively comply with multiple mandates without compromising on the rest of your program needs. Don’t tackle each mandate on a stand-alone basis. That’s too much duplication of effort, which leads to extra expenses, and it’s overwhelming for your staff. Without a comprehensive approach, your team might need to re-configure certain pieces of IT equipment several times! And each time could undo some or all of the previous work. I recommend you adopt a single internal program for your staff to follow where your policies, standards, processes, and procedures are influenced by, and mapped back to, all your mandates. Let’s look at the first bullet above more closely. By their nature, policies should be written at a high level and approved by your board of directors, so they don’t need to be changed more than once per year. Standards contain a level of detail below that of policies and may be changed by management as needed. To ensure procedures are followed correctly and consistently, you’ll want to go top-down through your management structure to get the direct support of all first level supervisors. Finally, processes are procedures that cross two or more interdependent departments, such as the way a customer’s order is fulfilled from start (order entry with Sales) to finish (order fulfillment by Operations). To manage this risk, I suggest you review your entire program design annually and make updates. Next week we’ll look at some specific examples, so come back.